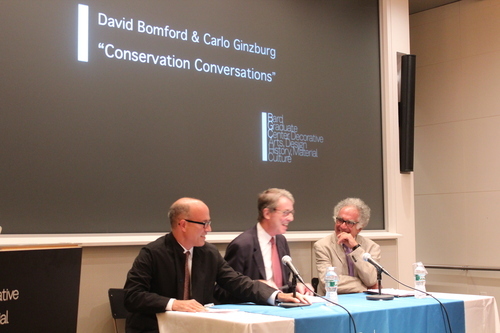 We officially launched the BGC autumn events series on September 10 with the inaugural event of the Conservation Conversations Seminar – a packed Lecture Hall heard David Bomford and Carlo Ginzburg speak. Bomford’s topic was Connoisseurship: The Rembrandt Paradigm, and Carlo Ginzburg spoke on Small Differences: Ekphrasis and Connoisseurship. The lively presentations were followed by a question and answer session with Dean Peter Miller as moderator. This new series, part of our new “Cultures of Conservation” initiative, is just beginning its second year with the support of a grant from the Andrew W. Mellon Foundation. These evenings will feature a dialogue between a conservator and a professor, and will address the many issues surrounding the interface between issues of conservation and the academy. David Bomford serves as Director of Conservation at the Museum of Fine Arts in Houston. He has been a consultant to the Director of the MMA, the Acting Director of the J. Paul Getty Museum, and the Assistant Restorer, Senior Restorer, and then Head, of the Registrar’s Office and Art Handling Department at the National Gallery, London. Bomford is the first conservator to ever hold the post of Slade Professor at Oxford. His talk focused on Rembrandt attributions, but stressed the new methodologies as one tool for the connoisseur. Carol Ginzburg currently is Franklin D. Murphy Professor of Italian Renaissance Studies at UCLA. His area of expertise embraces the Italian Renaissance and Early Modern Europe as a whole. Renowned for his book, The Cheese and the Worms: The Cosmos of a Sixteenth-Century Miller, he is widely published and the recipient of many awards and prizes including the Aby Warburg Prize for achievement in the Humanities and the Humboldt-Forschungs Prize. Most recently, he was awarded the Balzan Prize for the History of Europe, 1400-1700. Ginsburg’s talk centered on the relationship of words to images, and a discussion of the placement of ekphraseis (comments and description on a real or an imaginary artwork) within the context of connoisseurship. A great night and a wonderful opening for our fall season!